TOM WAGONER GREW UP A COWBOY ON A CATTLE RANCH IN WYOMING. TOM LEARNED EARLY ON THAT BETTERING COMMUNICATION WITH HIS HORSE, WHILE EARNING THEIR RESPECT AND TRUST, MADE RANCH WORK EASIER AND LIFE MORE ENJOYABLE. TOM SPENT MANY YEARS RIDING WITH AND LEARNING FROM SOME OF THE COUNTRY'S TOP HORSEMEN AND WOMEN. HE NOW ENJOYS SHARING HIS KNOWLEDGE AND UNIQUE TECHNIQUES WITH OTHERS THROUGH HIS COLT STARTING AND HORSEMANSHIP CLINICS. 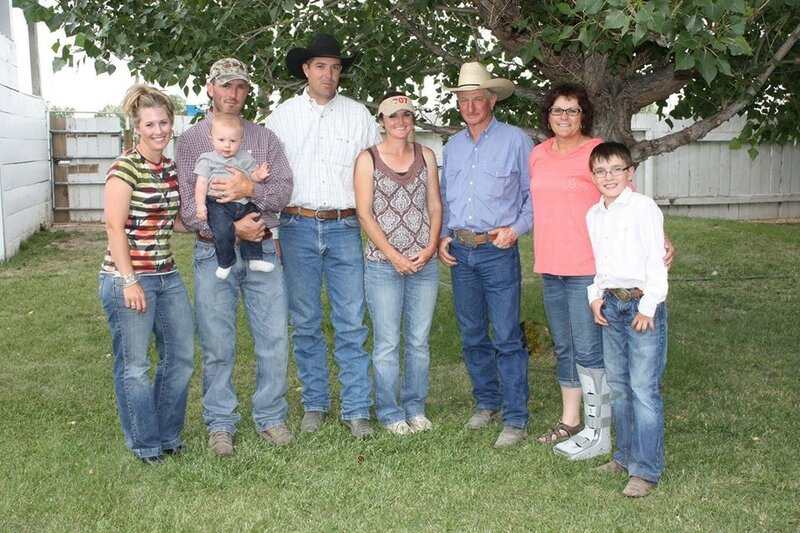 TOM AND HIS WIFE, TONI, NOW SPLIT THEIR TIME BETWEEN HOMES IN O'BRIEN, TEXAS AND BUFFALO, WYOMING. THEY HAVE TWO GROWN CHILDREN, ZANE (Marcie, Colt, Case) AND WENDY (Ben Greenough). TONI IS AN ACCOMPLISHED HORSEWOMAN HERSELF AND PAST BARREL RACING CHAMPION. SHE NOW ASSISTS TOM WITH HIS CLINICS AND IS AN INTEGRAL PART OF FEET FIRST HORSEMANSHIP. The Wagoner family...Marcie, Zane, Case, Ben, Wendy, Tom, Toni, and Colt.